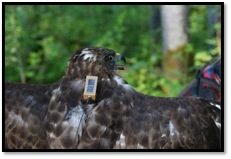 This summer, Erin Bayne’s lab at the University of Alberta in Edmonton assisted in the capture and deployment of various tracking devices on the broad-winged hawk and 4 other boreal bird species including; rusty blackbird, olive-sided flycatcher, palm warbler, and common nighthawk. This study is part of a collaboration with the Smithsonian Migratory Bird Center, in Washington D.C., as part of their Migratory Connectivity Project. Little is known about the paths these birds use on their migration but we can add to our knowledge by using emerging GPS technologies that led to development of transmitters which have, in the past, been too heavy to attach to birds! The broad-winged hawk is the only raptor of the 5 nesting species of interest in Northern Alberta. One might think because they are much larger than songbirds that finding them would be easier. However, this was not the case. Lab colleagues observed several birds incidentally, however, the broad-wings demonstrated how elusive they could be. 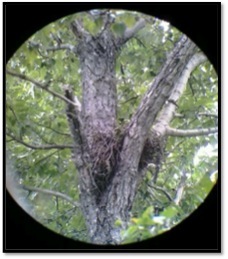 It took several days of surveying to pin down an active nest at which to trap. At a second site with territorial adults we were unable to locate the nest after intensive surveys! Coincidentally, these two sites happened to be only a few kilometers apart. After finding the two pairs of nesting hawks we monitored them for several weeks to insure they were still actively nesting. During the first week of July it was time to begin trapping so our crew of three headed to the forest. 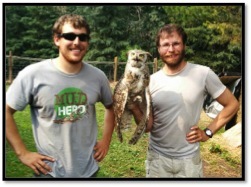 To capture the nesting adults we lured them in with a live great-horned owl (affectionately named Walter). 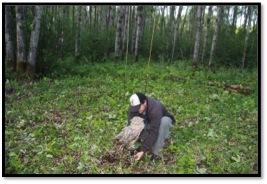 An owl lure is effective because the adult hawks are uneasy with the presence of an owl near the nest site and swoop down to try and scare the owl away. We set up dho-gazas (a netting made of thin material that is difficult to see) around Walter and he did his best to lure the hawks right into the net. It took Walter only 10 minutes on his perch to lure down his first catch of the day, an adult female broad-winged hawk. Good job Walt! We spent the next few minutes taking measurements and attaching the transmitter. The units are small, 9.5 gram solar transmitters which are attached like a backpack. 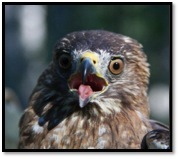 Each unit has 2 solar panels on the top face which allows them to charge continuously while on the hawks’ back. On our third day we successfully captured an adult male at the adjacent territory. At this point we thought we’d run out of options and we didn’t have a lot of hope in catching a third hawk. Luckily, as we began to consider wrapping up our trapping effort, our redoubtable Field Coordinator Alex MacPhail came through with a broad-winged detection. A morning was spent trying to re-sight the bird and we chanced upon the pair and their nest. 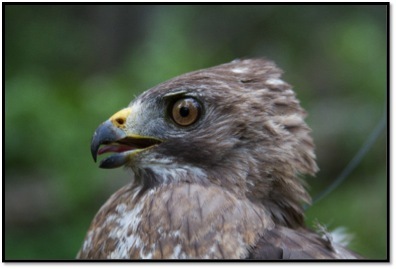 The following day we captured another female and were able to deploy our third transmitter, concluding our hawk quest! 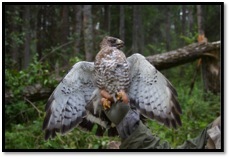 Of the boreal species in this study, the benefit of working with the comparatively larger broad-winged hawk is that they can carry heavier transmitters. This is great news for biologists who are interested in when and where the birds migrate. Every few days the transmitters send their data to a server where we can login and download the most recent movements. We are anxiously awaiting the beginning of fall migration so we can learn where broad-wings from Alberta’s boreal forest winter and which corridors they use to fly back “home”. You can track the broad-wings as they finish up on the breeding grounds and prepare to migrate south for the fall and winter. Post by Jesse Watson, photos by Jesse Watson, Anjolene Hunt, Natasha Annich, and Frank Pouw. 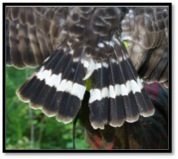 This entry was posted in birds, conservation, FieldWork Update, research, science by jahaines. Bookmark the permalink.